The Cavalier King Charles Spaniel is a small spaniel classed as a toy dog by The Kennel Club and the American Kennel Club, that originated in the United Kingdom. Since 2000, it has grown in popularity in the United States and ranks as the 19th most popular pure-breed in the United States. It has a silky, smooth coat and commonly a smooth undocked tail. The breed standard recognises four colours: Blenheim (chestnut and white), Tricolour (black/white/tan), Black and Tan, and Ruby. The breed is generally friendly, affectionate and good with both children and other animals; however, they require a lot of human interaction. Since they are a family dog, it is recommended to not leave them alone for long periods at a time. The expected average lifespan of a Cavalier King Charles Spaniel is under ten years. The Cavalier King Charles changed dramatically in the late 17th century, when it was interbred with flat-nosed breeds. Until the 1920s, the Cavalier shared the same history as the smaller King Charles Spaniel. Breeders attempted to recreate what they considered to be the original configuration of the breed, a dog resembling Charles II's King Charles Spaniel of the Restoration. Various health issues affect this particular breed. Cavalier King Charles Spaniel; lesser stop; skull not inclined to be domed with spot in centre of skull on the Blenheim. A white blaze between the eyes is standard of the Tricolour variety. During the early part of the 18th century, John Churchill, 1st Duke of Marlborough, kept red and white King Charles type spaniels for hunting. The duke recorded that they were able to keep up with a trotting horse. His estate was named Blenheim in honour of his victory at the Battle of Blenheim. Because of this influence, the red and white variety of the King Charles Spaniel and thus the Cavalier King Charles Spaniel became known as the Blenheim. Attempts were made to recreate the original Cavalier King Charles Spaniel as early as the turn of the 20th century, using the now extinct Toy Trawler Spaniels. These attempts were documented by Judith Blunt-Lytton, 16th Baroness Wentworth, in the book "Toy Dogs and Their Ancestors Including the History And Management of Toy Spaniels, Pekingese, Japanese and Pomeranians" published under the name of the "Hon. Mrs Neville Lytton" in 1911. In 1926, the American Roswell Eldridge offered a dog show class prize of twenty-five pounds of sterling silver each as a prize for the best male and females of "Blenheim Spaniels of the old type, as shown in pictures of Charles II of England's time, long face, no stop, flat skull, not inclined to be domed, with spot in centre of skull." The breeders of the era were appalled, although several entered what they considered to be sub-par Cavalier King Charles Spaniels in the competition. Eldridge died before seeing his plan come to fruition, but several breeders believed in what he said and in 1928 the first Cavalier club was formed. The first standard was created, based on a dog named "Ann's Son" owned by Mostyn Walker, and the Kennel Club recognised the variety as "King Charles Spaniels, Cavalier type". The Second World War caused a drastic setback to the emerging breed, with the vast majority of breeding stock destroyed because of wartime hardship and food shortages. For instance, in the Ttiweh Cavalier Kennel, the population of sixty dogs dropped to three during the 1940s. Following the war, few dogs survived as the new beginning from which all present-day Cavaliers descend. and in 1945 the Kennel Club first recognised the breed in its own right as the Cavalier King Charles Spaniel. The history of the breed in America is relatively recent. The first recorded Cavalier living in the United States was brought from the United Kingdom in 1956 by W. Lyon Brown, together with Elizabeth Spalding and other enthusiasts, she founded the Cavalier King Charles Club USA which continues to the present day. In 1994, the American Cavalier King Charles Spaniel Club was created by a group of breeders to apply for recognition by the American Kennel Club. The Cavalier would go on to be recognised by the American Kennel Club in 1995, and the ACKCSC became the parent club for Cavaliers. Historically the Cavalier King Charles Spaniel was a lap dog and is small for a spaniel, with fully grown adults comparable in size to adolescents of other larger spaniel breeds. Breed standards state that height of a Cavalier should be between 12 to 13 inches (30 to 33 cm) with a proportionate weight between 13 to 18 pounds (5.9 to 8.2 kg). The tail is usually not docked, and the Cavalier should have a silky coat of moderate length. Standards state that it should be free from curl, although a slight wave is allowed. Feathering can grow on their ears, feet, legs and tail in adulthood. Standards require this be kept long, with the feathering on the feet a particularly important aspect of the breed's features. The Cavalier King Charles Spaniel and the English Toy Spaniel can be often confused with each other. In the United Kingdom, the English Toy Spaniel is called the King Charles Spaniel while in the United States, one of the colours of the Toy Spaniel is known as King Charles. The two breeds share similar history and only diverged from each other about 100 years ago. There are several major differences between the two breeds, with the primary difference being the size. While the Cavalier weighs on average between 13 to 18 pounds (5.9 to 8.2 kg), the King Charles is smaller at 9 to 15 pounds (4.1 to 6.8 kg). In addition their facial features while similar, are different; the Cavalier's ears are set higher and its skull is flat while the King Charles's is domed. Finally the muzzle length of the Cavalier tends to be longer than that of its King Charles cousin. The breed has four recognized colours. 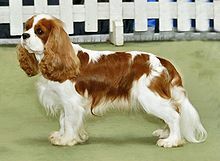 Cavaliers which have rich chestnut markings on a pearly white background are known as Blenheim in honour of Blenheim Palace, where John Churchill, 1st Duke of Marlborough, raised the predecessors to the Cavalier breed in this particular colour. In some dogs there is a chestnut spot in the middle of the forehead: this is called the "Blenheim" spot. The Blenheim spot is also known as the mark of the "Duchess Thumb Print", based on the legend that Sarah Churchill, Duchess of Marlborough while awaiting news of her husband's safe return from the Battle of Blenheim, pressed the head of an expecting dam with her thumb, resulting in five puppies bearing the lucky mark after news that the battle had been won. Black and Tan are dogs with black bodies with tan highlights, particularly eyebrows, cheeks, legs and beneath the tail. 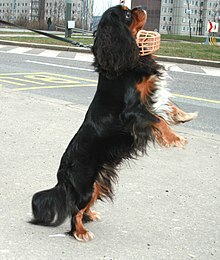 Black and Tan is referred to as "King Charles" in the King Charles Spaniel. 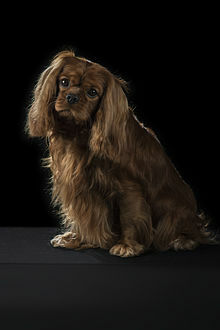 Ruby Cavaliers should be entirely chestnut all over, although some can have some white in their coats which is considered a fault under American Kennel Club conformation show rules. The fourth colour is known as Tricolour, which is black and white with tan markings on cheeks, inside ears, on eyebrows, inside legs, and on underside of tail. This colour is referred to as "Prince Charles" in the King Charles Spaniel. According to statistics released by The Kennel Club, Cavaliers were the sixth most popular dog in the United Kingdom in 2007 with 11,422 registrations in a single year. Labrador Retrievers were the most popular with 45,079 registrations in that year. Their popularity is on the rise in America; in 1998 they were the 56th most popular breed but in both 2007 and 2008 they were the 25th most popular. They ranked higher in some individual US cities in the 2008 statistics, being eighth in both Nashville and Minneapolis-St.Paul, seventh in Boston, Atlanta and Washington D.C., and sixth in both New York City and San Francisco. The breed's popularity has continued to grow, ranking in 18th place in 2013. In 2009, the Cavalier was the fourth most popular breed in Australia with 3,196 registrations behind only Labrador Retrievers, German Shepherd Dogs and Staffordshire Bull Terriers. In addition, there are also national breed clubs in Belgium, Canada, Czech Republic, Denmark, Finland, France, Germany, Netherlands, New Zealand, Norway, South Africa, Spain and Sweden. The breed is highly affectionate, playful, extremely patient and eager to please. As such, dogs of the breed are good with children and other dogs. Cavaliers are not shy about socialising with much larger dogs. They will adapt quickly to almost any environment, family, and location and suit city and country life. Their ability to bond with larger and smaller dogs makes them ideal in houses with more than one breed of dog as long as the other dog is trained. 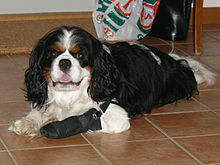 Cavaliers rank 44th in Stanley Coren's The Intelligence of Dogs, being of average intelligence in working or obedience. Cavaliers are naturally curious and playful, but also enjoy simply cuddling up on a cushion or lap, making them excellent companion or lap dogs for medical patients and the elderly. Cavaliers are active and sporting. Cavaliers are successful in conformation shows, obedience and agility and they also make wonderful therapy dogs due to their sweet, gentle natures. The breed is adaptable in their need for exercise, happy with either sleeping on the couch or taking long walks. They have an instinct to chase most things that move including vehicles on busy streets, and so most Cavaliers will never become "street-wise". As they tend to regard all strangers as friends, members of the breed will usually not make good guard dogs. Spaniels have a strong hunting instinct and may endanger birds and small animals. However, owners have reported that through training their Cavaliers live happily with a variety of small animals including hamsters and gerbils. The Cavalier's coat requires weekly brushing, but no trimming. However, some owners prefer to trim their Cavalier's long feathers and slippers which can become very dirty when walking or playing outside. Cavaliers can notably be prone to mitral valve disease, which leads to heart failure. This appears in many Cavaliers at some point in their lives and is the most common cause of death. Some serious genetic health problems, including early-onset mitral valve disease (MVD), the potentially severely painful syringomyelia (SM), hip dysplasia, luxating patellas, and certain vision and hearing disorders are health problems for this breed. As today's Cavaliers all descend from only six dogs, any inheritable disease present in at least one of the original founding dogs can be passed on to a significant proportion of future generations. This is known as the founder effect and is the likely cause of the prevalence of MVD in the breed. The health problems shared with this breed include mitral valve disease, luxating patella, and hereditary eye issues such as cataracts and retinal dysplasia. Cavaliers are also affected by ear problems, a common health problem among spaniels of various types, and they can have such other general conditions as hip dysplasia, which are common across many types of dog breeds. Nearly all Cavaliers eventually have mitral valve disease, with heart murmurs which may progressively worsen, leading to heart failure. This condition is polygenic (affected by multiple genes), and therefore all lines of Cavaliers worldwide are susceptible. It is the leading cause of death in the breed. A survey by The Kennel Club of the United Kingdom showed that 42.8% of Cavalier deaths are cardiac related. The next most common causes are cancer (12.3%) and old age (12.2%). The condition can begin to emerge at an early age and statistically may be expected to be present in more than half of all Cavalier King Charles Spaniels by age 5. It is rare for a 10-year-old Cavalier not to have a heart murmur. While heart disease is common in dogs generally – one in 10 of all dogs will eventually have heart problems – mitral valve disease is generally (as in humans) a disease of old age. The "hinge" on the heart's mitral valve loosens and can gradually deteriorate, along with the valve's flaps, causing a heart murmur (as blood seeps through the valve between heartbeats) then congestive heart failure. The Cavalier is particularly susceptible to early-onset heart disease, which may be evident in dogs as young as one or two years of age. Veterinary geneticists and cardiologists have developed breeding guidelines to eliminate early-onset mitral valve disease in the breed, but it is unclear if a statistically significant number of breeders follow these guidelines. The chairperson of the UK CKCS Club said in 2009: "There are many members who are still not prepared to health check their breeding stock, and of those who do, it would appear that many would not hesitate to breed from affected animals." The MVD breeding protocol recommends that parents should be at least 2.5 years old and heart clear, and their parents (i.e., the puppy's grandparents) should be heart clear until age 5. Syringomyelia (SM) is a condition affecting the brain and spine, causing symptoms ranging from mild discomfort to severe pain and partial paralysis. It is caused by a malformation, commonly known as Chiari Malformation, in the lower back of the skull which reduces the space available to the brain, compressing it and often forcing it out (herniating it) through the opening into the spinal cord. This blocks the flow of cerebral spinal fluid (CSF) around the brain and spine and increases the fluid's pressure, creating turbulence which in turn is believed to create fluid pockets, or syrinxes (hence the term syringomyelia), in the spinal cord. Syringomyelia is rare in most breeds but has become widespread in the Cavalier King Charles Spaniel, with international research samples in the past few years consistently showing over 90% of Cavaliers have the malformation, and that between 30–70% have syrinxes. However, most dogs with syrinxes are not symptomatic. Although symptoms of syringomyelia can present at any age, they typically appear between six months and four years of age in 85% of symptomatic dogs, according to Clare Rusbridge, a research scientist. Symptoms include sensitivity around the head, neck, or shoulders, often indicated by a dog whimpering or frequently scratching at the area of his neck or shoulder. Scratching is often unilateral – restricted to one side of the body. Scratching motions are frequently performed without actually making physical contact with the body ("air scratching"). The scratching behavior appears involuntary and the dog frequently scratches while walking – without stopping – in a way that is very atypical of normal scratching ("bunny hopping"). Scratching typical of SM is usually worse when the dog is wearing a collar, is being walked on leash, or is excited, and first thing in the morning or at night. Not all dogs with SM show scratching behavior. Not all dogs who show scratching behavior appear to be in pain, though several leading researchers, including Dr Clare Rusbridge in the UK and Drs Curtis Dewey and Dominic Marino in the US, believe scratching in SM cavaliers is a sign of pain and discomfort and of existing neurological damage to the dorsal horn region of the spine. If onset is at an early age, a first sign may be scratching and/or rapidly appearing scoliosis. If the problem is severe, there is likely to be poor proprioception (awareness of body position), especially with regard to the forelimbs. Clumsiness and falling results from this problem. Progression is variable though the majority of dogs showing symptoms by age four tend to see progression of the condition. A veterinarian will rule out basic causes of scratching or discomfort such as ear mites, fleas, and allergies, and then, primary secretory otitis media (PSOM – glue ear), as well as spinal or limb injuries, before assuming that a Cavalier has SM. PSOM can present similar symptoms but is much easier and cheaper to treat. Episodic Falling Syndrome can also present similar symptoms. An MRI scan is normally done to confirm diagnosis of SM (and also will reveal PSOM). If a veterinarian suspects SM he or she will recommend an MRI scan. Neurologists give scanned dogs a signed certificate noting its grade. Episodic Falling causes "exercise-induced paroxysmal hypertonicity" meaning that there is increased muscle tone in the dog and the muscles cannot relax. Previously thought to be a muscular disorder, it is now known to be neurological. EF is caused by a single recessive gene, and a genetic test is available. Except for severe cases, episodes will be in response to exercise, excitement or similar exertions. Although EF is often misdiagnosed as epilepsy, which typically results in loss of consciousness, the dog remains conscious throughout the episode. Severity of symptoms can range from mild, occasional falling to freezing to seizure-like episodes lasting hours. Episodes can become more or less severe as the dog gets older and there is no standard pattern to the attacks. The onset of symptoms usually occurs when a dog is between 4 months and 4 years of age. It is similar to Scotty Cramp, a genetic disorder in Scottish Terriers. About 1% of Cavaliers are affected by the condition, with 19% being carriers. Dogs with whole coloured coats were more likely to be affected than dogs with parti-coloured coats. As many as half of all Cavalier King Charles Spaniels may have a congenital blood disorder called idiopathic asymptomatic thrombocytopenia, an abnormally low number of platelets in the blood, according to recent studies in Denmark and the United States. Platelets, or thrombocytes, are disk-shaped blood elements which aid in blood clotting. Excessively low numbers are the most common cause of bleeding disorders in dogs. The platelets in the blood of many Cavalier King Charles Spaniels are a combination of those of normal size for dogs and others that are abnormally oversized, or macrothrombocytes. Macrothrombocytosis also is a congenital abnormality found in at least a third of CKCSs. These large platelets function normally, and the typical Cavalier does not appear to experience any health problems due to either the size or fewer numbers of its platelets. Hip dysplasia is a common genetic disease that affects Cavalier King Charles Spaniels. It is not present at birth but develops with age. Hip dysplasia is diagnosed by X-rays, but it is not usually evident in X-rays of Cavaliers until they mature. Even in adult spaniels with severe hip dysplasia, X-rays may not always indicate the disease. In a series of evaluations by the Orthopedic Foundation for Animals, the Cavalier was ranked 78th worst out of 157 breeds. The worst affected breeds were the Bulldog, Pug and Dogue de Bordeaux. Cavaliers can be subject to a genetic defect of the femur and knee called luxating patella. This condition is most often observed when a puppy is 4 to 6 months old. In the most serious cases, surgery may be indicated. The grading system for the patella runs from 1 (a tight knee), to 4 (a knee so loose that its cap is easily displaced). If a cavalier has a grade 1–2, physical rehabilitation therapy and exercise may reduce the grading and potentially avoid surgery. The grades 3–4 are most severe where surgery will most likely be needed to correct the problem to avoid the development of arthritis and lameness in the limb. A disorder commonly found in Cavaliers is keratoconjunctivitis sicca, colloquially known as "dry eye". The usual cause of this condition is an autoimmune reaction against the dog's lacrimal gland (tear gland), reducing the production of tears. According to the Canine Inherited Disorders Database, the condition requires continual treatment and if untreated may result in partial or total blindness. This disorder can decrease or heal over time. A 1999 study of Cavaliers conducted by the Canine Eye Registration Foundation showed that an average of 30% of all Cavalier King Charles Spaniels evaluated had eye problems. They include hereditary cataracts, corneal dystrophy, distichiasis, entropion, microphthalmia, progressive retinal atrophy, and retinal dysplasia. Primary Secretory Otitis Media (PSOM), also known as glue ear, consists of a highly viscous mucus plug which fills the dog's middle ear and may cause the tympanic membrane to bulge. PSOM has been reported almost exclusively in Cavaliers, and it may affect over half of them. Because the pain and other sensations in the head and neck areas, resulting from PSOM, are similar to some symptoms caused by syringomyelia (SM), some examining veterinarians have mis-diagnosed SM in Cavaliers which actually have PSOM and not SM. Cavalier King Charles Spaniels may be predisposed to a form of congenital deafness, which is present at birth, due to a lack of formation or early degeneration of receptors in the inner ear, although this is relatively rare. In addition, more recent studies have found Cavaliers that develop a progressive hearing loss, which usually begins during puppyhood and progresses until the dog is completely deaf, usually between the ages of three and five years. The progressive nature of this form of deafness in Cavaliers is believed to be caused by degeneration of the hearing nerve rather than the lack of formation or early degeneration of the inner ear receptors. ^ "Cavalier King Charles Spaniel Dog Breed Information". American Kennel Club. Retrieved 2019-01-30. ^ D G O'Neill; D B Church; P D McGreevy; P C Thomson; D C Brodbelt (2013). "Longevity and mortality of owned dogs in England". The Veterinary Journal. Veterinary Journal;2013;189(3):638-643. 198 (3): 638–643. doi:10.1016/j.tvjl.2013.09.020. PMID 24206631. Archived from the original on 17 November 2014. Retrieved 17 November 2014. ^ Lytton, Mrs. Neville (1911). Toy Dogs and Their Ancestors Including the History And Management of Toy Spaniels, Pekingese, Japanese and Pomeranians. London, England: Duckworth & Co. pp. 81–82. Retrieved 29 November 2009. ^ "A Potted History". The Cavalier King Charles Spaniel Club. 2009. Retrieved 17 November 2009. ^ "The Kennel Club". Retrieved 26 November 2016. ^ a b "Cavalier King Charles Spaniel". CavalierKingCharlesSpanielClub.co.za. Archived from the original on 22 April 2009. Retrieved 15 November 2009. ^ "Cavalier King Charles Spaniel Dog Breed Information". American Kennel Club. ^ "The Legendary Blenheim Spot". Charming Cache Cavaliers. Retrieved 30 November 2013. ^ "AKC MEET THE BREEDS: Cavalier King Charles Spaniel". American Kennel Club. Retrieved 5 April 2010. ^ "2007 Top 20 Breed Registrations". The Kennel Club. Retrieved 15 November 2009. ^ "AKC Dog Registration Statistics". American Kennel Club. Retrieved 15 November 2009. ^ a b "Top 10 Most Popular Breeds in the 50 Largest U.S. Cities Page 3". American Kennel Club. Archived from the original on 18 February 2015. Retrieved 17 November 2009. ^ "Top 10 Most Popular Breeds in the 50 Largest U.S. Cities Page 1". American Kennel Club. Archived from the original on 18 February 2015. Retrieved 17 November 2009. ^ a b "Top 10 Most Popular Breeds in the 50 Largest U.S. Cities Page 5". American Kennel Club. Archived from the original on 18 February 2015. Retrieved 17 November 2009. ^ "Overseas Cavalier Clubs". The Cavalier King Charles Spaniel Club. 2009. Archived from the original on 29 March 2010. Retrieved 17 November 2009. ^ "Cavalier King Charles Spaniel Training and Cavalier Dog Breed Info". Puppy-Training-at-Home.com. Archived from the original on 9 October 2009. Retrieved 15 November 2009. ^ "Cavalier King Charles Spaniels". TerrificPets.com. Retrieved 15 November 2009. ^ "General Information". Cavalier King Charles Spaniel Club – USA. Retrieved 15 November 2009. ^ "Cavalier FAQ". Cavalier King Charles Spaniel Club – USA. Retrieved 15 November 2009. ^ Alex., Gough (2010). Breed predispositions to disease in dogs and cats. Thomas, Alison, 1964- (2nd ed.). Chichester, West Sussex: Wiley-Blackwell. ISBN 9781405180788. OCLC 467711662. ^ "Breed Profile: The English Toy Spaniel or King Charles Spaniel". English Toy Spaniel Club of America. Archived from the original on 8 December 2009. Retrieved 22 November 2009. 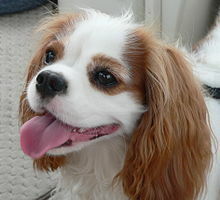 ^ "Summary Results of the Purebred Dog Health Survey for Cavalier King Charles Spaniels" (PDF). Kennel Club/British Small Animal Veterinary Association Scientific Committee Summary results. Archived from the original (PDF) on 24 July 2008. Retrieved 14 November 2009. ^ "Mitral Valve Disease and Cavalier King Charles Spaniels". CavalierHealth.org. Retrieved 14 November 2009. ^ "Mitral Valve Disease Breeding Protocol for the Cavalier King Charles Spaniel". CavalierHealth.org. Retrieved 14 November 2009. ^ Wedderburn, Pete (27 March 2009). "Dog breeders in denial". The Daily Telegraph. Retrieved 5 April 2010. ^ "Important Findings At CKCSC, USA'S Heart Symposium" (PDF). Cavalier King Charles Spaniel Club. Retrieved 14 November 2009. ^ "Syringomyelia (SM) and the Cavalier King Charles Spaniel". CavalierHealth.org. Retrieved 14 November 2009. ^ a b c Rusbridge, Clare (2007). Chiari-Like Malformation and Syringomyelia in the Cavalier King Charles Spaniel. Utrecht University. ISBN 978-90-393-4456-9. OCLC 123300926. Archived from the original (PhD thesis) on 30 October 2009. Retrieved 14 November 2009. ^ "Primary Secretory Otitis Media (PSOM) in the Cavalier King Charles Spaniel". CavalierHealth.org. Retrieved 14 November 2009. ^ a b Gill, Jennifer L.; Tsai, Kate L.; Krey, Christa; Noorai, Rooksana E.; Vanbellinghen, Jean-François; Garosi, Laurent S.; Shelton, G. Diane; Clark, Leigh Anne; Harvey, Robert J. (January 2012). "A canine BCAN microdeletion associated with episodic falling syndrome". Neurobiology of Disease. 45 (1): 130–136. doi:10.1016/j.nbd.2011.07.014. PMC 3898273. PMID 21821125. ^ "Episodic Falling Syndrome (Muscle Hypertonicity): Cavaliers Collapse Suddenly After Exercise". CavalierHealth.org. Retrieved 14 November 2009. ^ Slatter, Douglas H. (2003-01-01). Textbook of Small Animal Surgery (3rd ed.). W.B. Saunders Company. p. 1094. ISBN 978-0-7216-8607-3. ^ "Frequency of two disease-associated mutations in Cavalier King Charles Spaniels" (PDF). Animal Health Trust. Retrieved 28 June 2012. ^ "Blood Platelets in Cavaliers: Too Few (Thrombocytopenia) and Too Large (Macrothrombocytopenia)". CavalierHealth.org. Retrieved 14 November 2009. ^ "Hip Dysplasia in Cavaliers: Painful and Expensive". Cavalier Health.org. Retrieved 5 April 2010. ^ "Hip Dysplasia Statistics". Orthopedic Foundation for Animals. Archived from the original on 10 February 2010. Retrieved 5 April 2010. ^ "Patellar Luxation in Cavaliers: Genetic and Degenerative". Cavalier Health.org. Retrieved 5 April 2010. ^ "Dry Eye Syndrome: A Life-Long Irritating Defect for Cavaliers". CavalierHealth.org. Retrieved 14 November 2009. ^ "What is keratoconjunctivitis sicca (KCS)?". Canine Inherited Disorders Database. 11 May 2000. Retrieved 14 November 2009. ^ Wheeler, Cynthia A. (1999). Ocular Disorders Presumed to be Inherited in Purebred Dogs. American College of Veterinary Ophthalmologists. ISBN 978-0-9635163-2-9. ^ "Corneal Dystrophy and the Cavalier King Charles Spaniel". CavalierHealth.org. Retrieved 14 November 2009. ^ "Deafness in Cavalier King Charles Spaniels can be Congenital or Progressive". CavalierHealth.org. Retrieved 14 November 2009. ^ a b "I want the act saying that King Charles spaniels have special rights in the Houses of Parliament". Parliament.uk. Archived from the original on 4 May 2016. Retrieved 29 May 2016. ^ "Feeding your small breed puppy". Kennel Club. Archived from the original on 30 June 2016. Retrieved 29 May 2016. ^ "The Cavalier". Buchlyvie chapter No 513 Order of The Eastern Star. "AKC MEET THE BREEDS: Cavalier King Charles Spaniel". American Kennel Club. Retrieved 5 April 2010. "AKC Dog Registration Statistics". American Kennel Club. Retrieved 15 November 2009. "A Potted History". 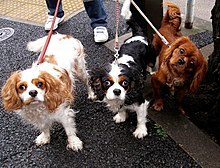 The Cavalier King Charles Spaniel Club. 2009. Retrieved 17 November 2009. "Cavalier King Charles Spaniel". CavalierKingCharlesSpanielClub.co.za. Archived from the original on 22 April 2009. Retrieved 15 November 2009. Coile, D. Caroline (2008). Cavalier King Charles Spaniels (2nd ed.). Barron's Educational Series. ISBN 978-0-7641-3771-6. "Cavalier King Charles Spaniels". Blenheim Company. Retrieved 15 November 2009. Dupre, Malcolm. "Cavalier King Charles Spaniel History". Barkbytes.com. Retrieved 14 November 2009. "2007 Top 20 Breed Registrations". The Kennel Club. Retrieved 15 November 2009. Lytton, Mrs. Neville (1911). Toy Dogs and Their Ancestors Including the History And Management of Toy Spaniels, Pekingese, Japanese and Pomeranians. London, England: Duckworth & Co. pp. 81–82. Retrieved 29 November 2009. Moffat, Norma (2006). Cavalier King Charles Spaniel: Your Happy Healthy Pet (2nd ed.). John Wiley & Sons. ISBN 978-0-471-74823-6. Wheeler, Cynthia A. (1999). Ocular Disorders Presumed to be Inherited in Purebred Dogs. American College of Veterinary Ophthalmologists. ISBN 978-0-9635163-2-9. Wikimedia Commons has media related to Cavalier King Charles Spaniel.